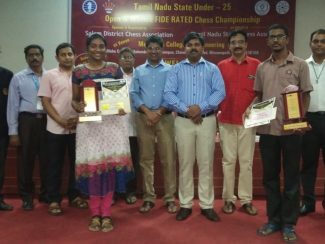 20th Tamil Nadu State Under 25 Open Fide Rated Chess Championship & 17th Tamil Nadu State Under 25 Women Fide Rated Chess Championships got under way at Mahendra College of Engineering, Salem, a leading engineering college in Salem District, from 15th to 19th June 2018, organized by Salem District Chess Association. The open section attracted 137 participation from 22 Districts and Women section attracted 47 participants from 12 Districts in 9 round Swiss league event with a time control of 90 minutes plus 30 seconds increment per move for each player. Dr. N Shanmuga Sundara Raju, the Dean (Academic), Mahendra College of Engineering, inaugurated the event in the presence of Dr. V Ponniyin Selvan, the Controller of Examniation, Mahendra College of Engineering, Shri J Balakrushnan, President, Salem District Chess Association, Shri. M Ephrame IA, the Chief Arbiter and Shri. P Satheesh, Physical Education Director, Mahendra College of Engineering. Barath Kalyan of Thiruvarur was the top seeded followed by Mythireyan of Chennai and Vaisnav of Tirupur. The 69th seeded S Kaarthik, a local boy from Salem shocked the top seeded M Barath Kanyan of Tiruvarur in round one. Hemanth Raam and Sanjay of Chennai led the field with 5 points each at the end of the fifth round. 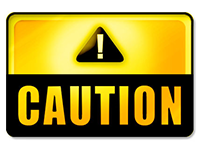 The encounter between Sanjay and Hemanth Raam ended in favor of Hemanth Raam which helped him to be the sole leader with 6 points at the end of round 6. Hemanth winning strike continued in round 7 also, he out played Vaisnav of Tripur and continued the lead with one full point from his nearest rivals. The penultimate round result was much interesting, Hemanth Raam was hold by his team mate Selvabharathi but Hemanth continued the lead with half a point. Hemanth needed a draw in his final round game against K S Yuvan Bharathi of Karur for the title and the last round favored Hemanth with a draw. 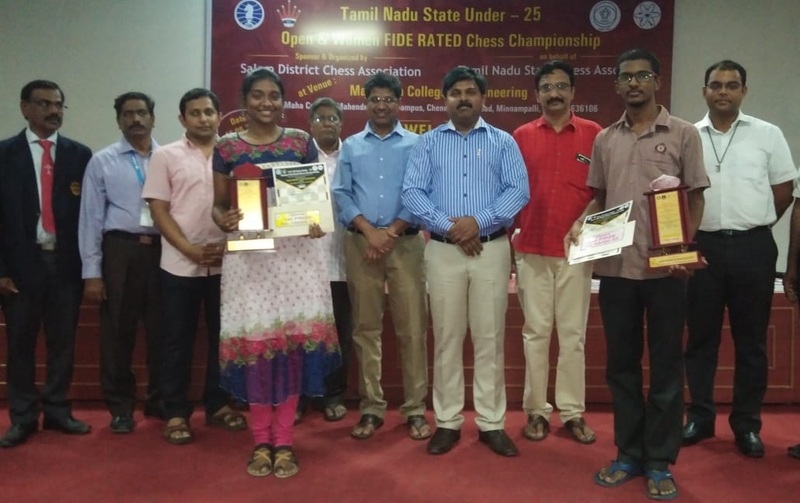 Two players tied were for the second place with 7.5 points, Yuvan Bharathi and Selvabharathy but a better tie break helped Yuvan Bharathi finished the second place and Selvabharathy on third place respectively. In the women section Harivardhini of Thiruvallur District was the top seeded followed by P. Thamaraiselvi of Chennai and S Jayasree of Salem. 11th seeded Leaha of Kanyakumari shocked 4th seeded Jayasree of Salem in the third round. Top seeded Harivardhini and 2nd seeded Thamaraiselvi joined the lead with 5 points at the end of round 5. The encounter between the leaders ended with draw on the 6th round and both of them continued the lead with 5.5points. On round 7 Harivardhini was held by Genita Gladys of Erode whereas Thamaraiselvi won her game against S Jayasree of Salem and took the lead with 6.5 points. Thamaraiselvi’s winning strike continued in round 8 and maintain half a point lead with her nearest rival Harivardhini. On the final round both top boards were saddled with a draw and Thamaraiselvi won the Championship with 8 points. Harivardhani became the runner up with 7.5 points. The Chief guest of the prize distribution function Shri. R. Sadheesh, M.A, M.Phil, Corporation Commissioner, Salem District gave away the prizes. Rev. Br. John Joseph Superior General, Holy Cross Congregation, Salem was the guest of honour. Rev. Br. Santhose, Principal Holy Cross Matric. Hr. Sec. School, Dr. N. Mohanasundararaju, Dean Academic, Mahendra College of Engineering Salem, Dr. V Ponniyin Selvan, the Controller of Examination, Mahendra College of Engineering, Salem and Mr. M. Senthilvel Joint Secretary, TNSCA felicitated the event. Mr. N. Arun, Secretary, Salem District Association welcomed the gathering Mr. Palaniappan IA proposed the vote of thanks. Praggnanandhaa becomes the 2nd youngest GM in the history of chess!